Under natural conditions, Lālākea Stream, its tributary and Hakalaoa Stream flow over the pali above Waipiʻo Valley as the famous Hiʻilawe Twin Falls. The twin falls are Hiʻilawe Falls to the west and Hakalaoa Falls to the east. The twin falls converge in a huge plunge pool at the bottom of the pali to form Hiʻilawe Stream, one of two primary waterways that flow through Waipiʻo Valley to the ocean. Hiʻilawe Stream supports loʻi kalo, native stream life, productivity in nearshore waters, fishing, gathering and other traditional and customary Hawaiian practices. Hiʻilawe Waterfall is one of the tallest waterfalls in Hawaiʻi dropping about 1,450-feet, with a main drop of 1,201-feet into Waipiʻo Valley on Lālākea Stream. In the early-1900s, the streams feeding the falls were diverted so the water could to be used for irrigation of sugar cane plantations, like many other streams in Hawaiʻi. A concrete barrier, or "diversion", had been built at the 2,000-foot elevation, high above the valley. With the reduction of water, there were no longer two waterfalls at Hiʻilawe, typically only one waterfall had water flowing. The diverted water was last used by the Hāmākua Sugar Company in 1989. In 1994, Kamehameha Schools (KS) obtained the Lālākea Ditch when it acquired Hāmākua Sugar Company land. The ditch continued to divert an average of 2.5-million gallons of water a day from the streams to the Lālākea Reservoir, where the unused water flowed into a dry gully. In lieu of a hefty fine for failing to provide evidence of long-term use of water diverted by the Lālākea Ditch, KS was required to fund studies or other stream-related projects of comparable value. When I served as Chair of the State Commission on Water Resource Management (Water Commission,) KS submitted and we approved a plan to fully restore flows to three streams that feed the famous Hiʻilawe Twin Falls. The restoration of Lālākea and Hakalaoa streams and a tributary of Lālākea Stream is only the second stream restoration in the history of the State Water Code, which was enacted in 1987. The first stream restoration under the code was the partial restoration of Waiāhole, Waianu and Waikāne streams in Windward O`ahu. Not only was there less water flowing, but it flowed slower and was warmer which affected the plants and animals that live in the stream. Abandoning the Lālākea Ditch and restoring the streams is necessary to support native stream life and the traditional and customary practices that rely on Hiʻilawe Stream. In addition, KS prepared the Waipiʻo Valley Stream Restoration Study, the first-ever study of completely restoring a Hawaiian stream to natural flow conditions. Stream restoration effects studied by KS include: water quality, stream flow, habitats and biota. This study was conducted by scientists from Bishop Museum and other institutions, with student scientists from the Island of Hawaiʻi collaborating and contributing to data collection and analysis. 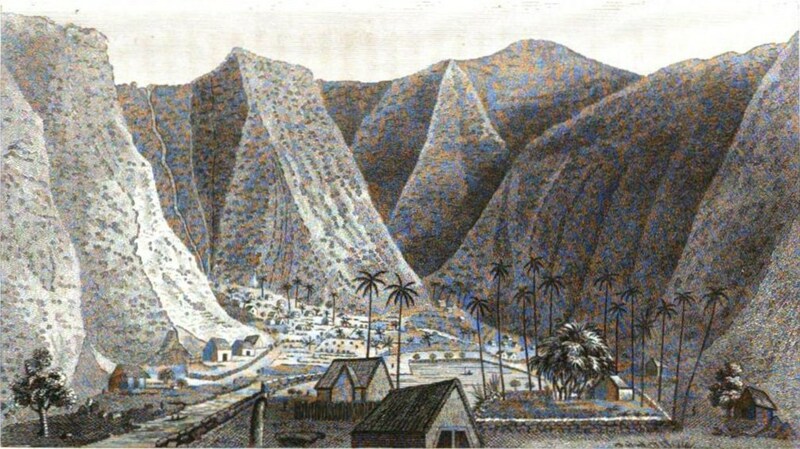 The image shows Waipiʻo in a sketch drawn by William Ellis in about 1822-1823, Hiʻilawe Twin Falls is to the left. In addition, I have included some other images of the falls and this area in a folder of like name in the Photos section on my Facebook page.